WASHINGTON, DC, December 12, 2011 (ENS) – The Georgia Department of Transportation and a Tennessee construction company have agreed to pay a $1.5 million penalty to the U.S. Treasury and spend an additional $1.3 million to offset environmental damages. The payments and remediation will resolve alleged violations of the Clean Water Act in Georgia. The civil penalty is one of the largest ever under the Clean Water Act provisions prohibiting the unauthorized discharge of dredged or fill material into waters of the United States, the U.S. Environmental Protection Agency and Department of Justice said today, announcing the settlement. The U.S. government complaint alleges that between 2004 and 2007, Wright Brothers Construction Co., based in Charleston, Tennessee, with approval from the Georgia Department of Transportation, buried all or parts of seven primary trout streams in violation of the Clean Water Act. Wright damaged the streams while disposing of excess soil and rock material generated from the U.S. Route 441 and U.S. Route 76 expansion projects in northeast Georgia’s Rabun County, the federal government alleges. Wright Brothers was hired by GDOT to dispose of excess material from the two highway expansion projects. The contracts between GDOT and Wright Brothers required Wright Brothers to obtain written environmental clearance from GDOT prior to using any site as a fill site. The U.S. government complaint alleges that GDOT approved sites that included streams considered to be waters of the United States. These actions resulted in the unauthorized disposal of more than one million cubic yards of excess rock and soil, impacting a total of more than 2,800 linear feet of streams. All of the streams that were filled are tributaries of either Lake Burton or Tallulah Falls Lake. 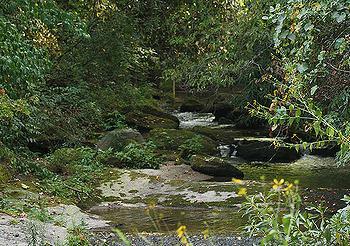 Burying and piping the streams has destroyed valuable aquatic habitat and has reduced the streams’ ability to cycle nutrients, export carbon and reduce nitrogen, says the EPA. The reduced water quality may have adversely impacted downstream trout populations, which are a major recreational resource to the region. Under the settlement, Wright Brothers and GDOT must purchase 16,920 mitigation credits at an estimated cost of $1.35 million to offset the impacts to waters of the United States that cannot be restored. The credits must be purchased from mitigation banks servicing the area in which the violations occurred. A mitigation bank is a wetland, stream, or other aquatic resource area that has been set aside for the purpose of providing compensation for impacts to aquatic resources that occurred under a federal, state, or local permit. Wright Brothers and GDOT also will remove the piping from and restore the bed and bank of a 150-foot stream channel that was impacted by the disposal activities. The estimated cost of this work is $25,000. When complete, the restoration activities and injunctive relief measures will mitigate the 2,800 feet of stream impacted by dumping. The settlement is subject to a 30 day comment period and final court approval.